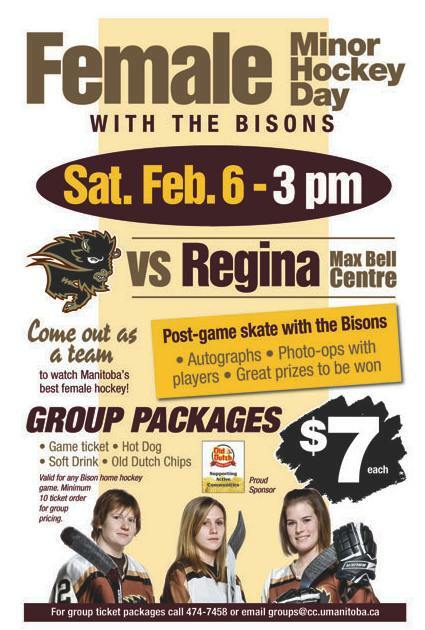 Bison Sports at the University of Manitoba will host their first annual Female Minor Hockey Day with the Bisons on Saturday. The action begins when the Bison women’s hockey team take on the Regina Cougars. A post-game skate will follow for female minor hockey players with the entire Bison women’s team (skates and helmets required). Prizes for kids in attendance will also be available. Jennifer Botterill has donated some Olympic merchandise and the first 200 girls to the game will receive Jen’s Olympic Team Canada cards. Game time is 3 p.m. at Max Bell Centre. Tickets are available at the door.